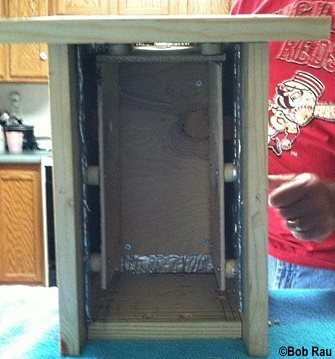 We received pictures and plans for a bluebird house from Mark LaTorre from Alabama. Mark had bluebirds nesting for the third time in July last year and was concerned that the bluebirds and eggs were getting over heated during the hottest days. On a 98 degree day, he noticed the female was panting heavily with her head out of the box. No doubt, the female was stressed and that probably meant the eggs were also heat stressed. One of the eggs from that clutch did not hatch and Mark thinks this may be due to heat stress. It is a wonder that any of the eggs hatched. It has also been documented that heat stressed eggs can have lower fledging success even if they do hatch, so everything we can do to reduce heat in the nest box can help increase the number of young that fledge. 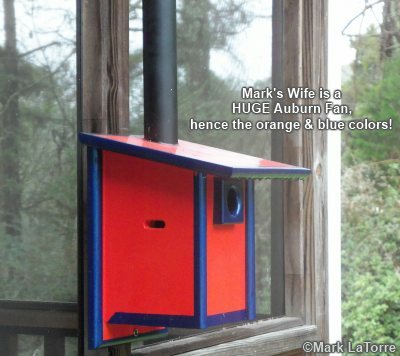 Mark obviously has carpentry skills and has designed a bluebird box with an airspace between the inner and outer walls. In addition, the plans include a black vent pipe that when heated, will draw air into the air space from below the box (See photo above). But first, all you "Roll-tide" fans, brace yourselves. Yes he did. Those are Auburn Tiger colors. For those of you who don't know, we're talking Auburn University Football. Mark says he has never painted a box before, but so much time and effort went into this project, that he wanted it to last. If you're going to paint it, might as well paint it with the colors of your favorite team, or in Mark's case, his wife's favorite team. 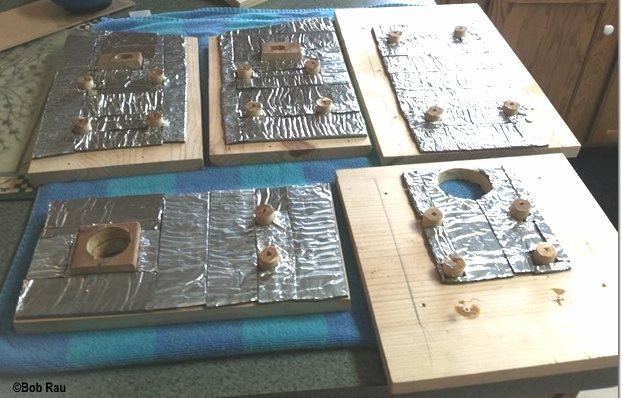 We have no doubt this design will reduce the temperature inside the nest box considerably on very hot days, but will the boxes be too cool on those cold spring days? The exhaust pipe could be unplugged as daytime temperatures rise above the 90s (degrees F). Bluebirds eggs and nestlings can tolerate temperatures above 104° F for short times, but temperatures above 107° F will kill them. Even if they hatch, their ability to grow properly my be compromised and their survival may still be threatened. We discussed the "Problems with Heat and Bluebird Boxes" on our other bluebird house plans page. Official temperatures are measured in open shade 1.5 meters above the ground. Most bird nest boxes are placed above ground, but many are not placed in the shade. We have measured temperatures inside empty bird nest boxes above 105° F on several occasions. This summer, we plan to make some side by side comparisons of boxes in direct sun to measure the effects of some simple shading devices that can be used in emergencies. We hope Mr. LaTorre will also record some temperature reading inside his bluebird house to see how effective the ventilation system is. Thanks again Mark for your efforts to make a better bluebird nest box. We hope your hard work is rewarded with three successful clutches of bluebirds this nesting season. I did record through the entire summer that year and found that the temp in my screened in shaded porch was the same as the bird house that was located in the afternoon sun on the west side of the house. I built one of these for my sister and she sees a clutch every year. I on the other hand have not been as fortunate with mine, I think I have it mounted too close to the windows. That's awesome that his sister has had a successful clutch every year in his hot-weather bluebird house design. Mark's box may be too close to the windows or some other various reasons. Birds can be fussy about choosing their nesting cavity. We had a bluebird house mounted near our front porch. The first couple of years the bluebirds used it, then all of a sudden stopped. We saw them flying around the box, but never began nest-building. We think our trees and shrubs around the front yard grew tall and dense enough that it became to enclosed and not enough open space which bluebirds prefer. Below are Mark's plans. This project is not for beginners. For easier plans, see this One-Board Bluebird House Design. The plans show enough detail that experienced builders will be able to figure it out. If you have any questions use our contact page. Mark sent another pic that helps show how the box was constructed. 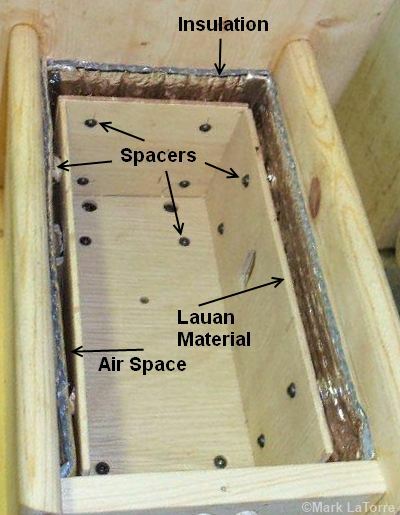 The photo shows the inner Lauan box inside the outer box, with the insulation, spacers and air space. Also notice the pocket screws used to hold the sides to the bottom. Mark also sent more pictures of the construction of the vent pipe (heat tube) and cover (deflector cone or rain cap). His first house is protected by the eave of his house, so does not need the cover. His sister's box will be mounted in the open, so a cover is needed to prevent rain from dripping into the box. The deflector cone is made by cutting a slice out of a flat circle of aluminum material and the cone is formed when the slice is pinched back together. A paper model is a good way to test for best size of circle and slice of material to cut for the desired cone. 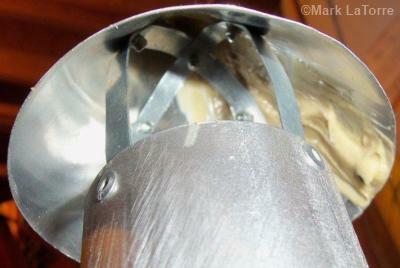 The photo shows the cone attached to an aluminum tube with aluminum straps with pop rivets. The entire assembly was then slid down inside the black PVC pipe and pop riveted into place. Mark also installed a grating in the top of the tube to keep the squirrels from stopping up the tube with acorns and sticks. 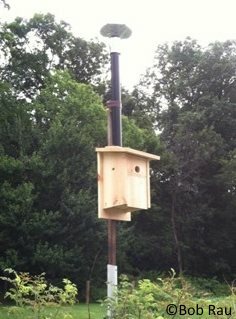 As we noted above, Mark built a second bluebird house for his sister with a rain cap on top of the vent pipe, but also with a metal bird house hole guard over the entrance hole to keep the squirrels from chewing it out. Follow the link above to check out how he installed the washer and donut cover over the entrance hole. Recently, a visitor to our website submitted photos of the bluebird house he built using these hot-weather plans. Bob first contacted us regarding the vent pipe. He could not find black PVC pipe, so as an alternative he spray painted it black. The dark colored pipe will heat up more so than the white PVC which helps moves the hot air out from inside the box. 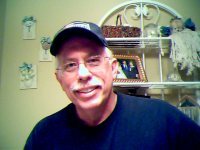 Compliments of Bob Rau, below are additional photos and comments that may help you with building this house. 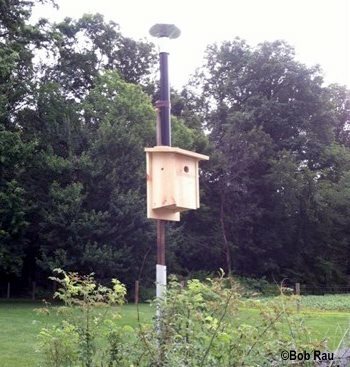 "Hi, we finally got the ventilated bird house made and it turned out great. In fact we already have a pair of bluebirds checking it out. Here is a few pics of the house in the making and finished and mounted. We did not paint it as we like our houses with the natural wood look." "Hi, we are so excited to report that our pair of bluebirds finished their nest building and as of today have two eggs laid in the new ventilated nest we built last week for them. 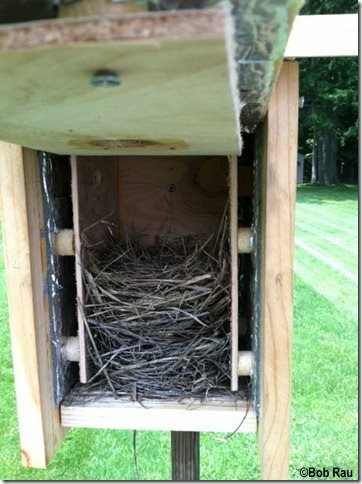 Above is a picture of the finished nest inside the new box." 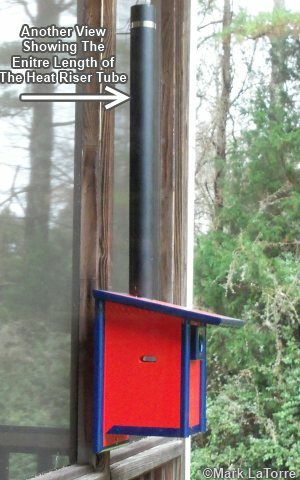 Bluebird House Plans - Basic one-board bluebird bird house plans and others including Peterson, Gilbertson and boxes for Western and Eastern Bluebirds.